Quick Assist, originally known as Windows Remote Assistance, is a feature of Windows XP and later that allows a user to temporarily view or control a remote Windows computer over a network or the Internet to resolve issues without directly touching the unit. It is based on the Remote Desktop Protocol (RDP). It is complemented by Get Help, a feature introduced in Windows 10 that enables the user to contact Microsoft directly but does not allow for remote desktopping or screen sharing. Quick Assist is installed by default on Windows clients, but must be added manually on Windows Server 2008 R2 servers. Quick Assist requests a code in order to match users to a session. This will allow the giver to access the computer of the receiver in Administrator mode while allowing the receiver to see the choices the giver made. In Windows Vista, Remote Assistance is based on RDP 6 and Windows Desktop Sharing API. It is a standalone application and does not use the Windows Help and Support Center or Windows Messenger. Two systems administrators can simultaneously connect to a single computer. Remote sessions automatically reconnect after restarting the computer. It also supports session pausing, built-in diagnostics, chat, file transfer and XML-based logging. It reduces bandwidth requirements for low-speed connections. NAT traversal allows a session to be established even if the user is behind a Network Address Translation (NAT) device. Remote Assistance is configurable using Group Policy and supports command-line switches so that custom shortcuts can be deployed. In Windows 7, Remote Assistance is based on RDP 7 and uses Peer Name Resolution Protocol when connecting using the Easy Connect option. With Easy Connect, only a password needs to be shared instead of an invitation file, and two computers can establish a peer-to-peer connection over the Local Area Network (LAN) or the Internet without a relay server. Windows Remote Assistance does not support file transfer and clipboard sharing in Windows 7. Remote Assistance is installed by default on Windows clients, but must be added manually on Windows Server 2008 R2 servers. Remote assistance sessions may be initiated using the Windows Remote Assistance application available on the Start menu under All Apps → Maintenance or by invoking msra.exe from command-line interface. The original Remote Assistance is included on all releases of Windows 10 as well, but since the Windows 10 Anniversary Update, its Start menu shortcut is removed, effectively hiding it from the user. Instead, a new app called Quick Assist is added. It has the same functionality and a fairly similar user interface, but it uses a solid white background and wireframe icons, similar to the Universal Windows Platform apps. 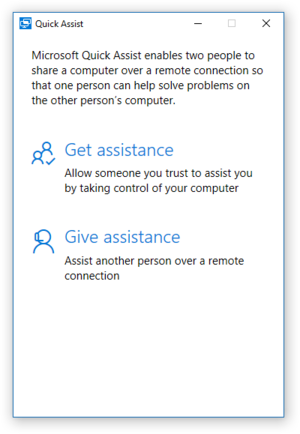 Unlike Remote Assistant, Quick Assist requires the giver to sign in using a Microsoft account before dispensing help. Quick Assist, unlike Remote Assistance, presents a sparse screen with an explanation of its intended use and two options: Get assistance and Give assistance. ^ "Remote Assistance and Resulting Internet Communication in Windows 7 and Windows Server 2008 R2". TechNet. Microsoft. ^ "Writing a Desktop Sharing Application". Enterprise Mobility and Security Blog. Microsoft. 23 March 2007. ^ "Why doesn't windows 7 Remote Assistance support sharing clipboard and file transfer? Are there any work arrounds? [sic]". Windows Client TechCenter > Windows 7 IT Pro Forums > Windows 7 Networking. Microsoft TechNet Social. 2010-12-10. Retrieved 2011-11-09. ^ Popa, Bogdan (9 August 2016). "Microsoft Highlights Its Windows 10 Anniversary Update TeamViewer Killer". Softpedia. SoftNews SRL. ^ Srinivasan, Ramesh (2016-08-08). "Using Windows 10's New "Quick Assist" App (Walkthrough)". Winhelponline. "Windows Desktop Sharing API". Enterprise Mobility + Security blog. Microsoft. 8 March 2007. Torre, Charles (16 October 2006). "Windows Vista Remote Assistance: Under the Hood". Channel 9. Microsoft. Tulloch, Mitch; Northrup, Tony; Honeycutt, Jerry (2010). "23: Support Users with Remote Assistance" (PDF). Windows 7 Resource Kit. Redmond, WA: Microsoft Press. ISBN 9780735627000. This page was last edited on 18 March 2019, at 23:39 (UTC).